To hear all the whining from Brussels over the weekend, you would think the EU was being run by some sad combination of Arsène Wenger and José Mourinho. Not a bad analogy actually, since the EU case has as many holes in it as Arsenal’s defence. The malicious leaks to a German newspaper from, it’s widely believed, Juncker’s hatchet man Martin Selmayr, speaks more of panic than the precise thinking of proper negotiators. "Theresa May is living on another galaxy, she is deluding herself," Juncker is supposed to have told Angela Merkel after his dinner at No.10. But who is the deluded one? Mrs May for saying “Non”, (for which there are useful historical precedents) or Juncker expecting her to fall over like an inexperienced drinker at the first whiff of a barmaid’s apron? Are we really going to pay €52 billion, just like that? She’s not Tommy Cooper, you know, Jean-Claude. Are we really going to let them determine when crucial points are to be decided? Mrs May wants to sort out the rights of EU residents here and British residents there as a first point. Sensible, since there’s every prospect of an easy agreement on that. It now seems from leaked documents, Brussels wants to block any such agreement, whilst calling for it publicly. Murky waters, my friends. But clear enough to allow us to be certain that there is a cynical immaturity about Juncker’s negotiating position that makes "non" the best strategy. And I am sure it’s the one that frightens Juncker and his gang the most. What they dread above everything else is that we just leave without an agreement. What could they do? Invade? The reality is that the EU is all over the place and not just on Brexit either. Behind that fake show of unity, where the 27 other members purported to agree their negotiating position with Britain in less than a minute, lies chaos and confusion. Based of course on there being no community of interest between an increasingly militant Eastern Europe, and Western Europe; between Southern Europe, mired in economic gloom and rampant Germany. Even between France and Germany, where the French Presidential Election is a contest between a beginner, and a neo-fascist. And the beginner, Emmanuel Macron, having sampled the opinion of French voters, now says the EU is "dysfunctional, unsustainable, and must be overhauled". People, he says, are "extremely angry". Where’s the unity in all that? And even Mrs Merkel has her problems. How many more terrorist incidents, occasioned by her absurd decision to let in one million migrants, most of them not legitimate refugees at all, has there got to be, before her own hold on power, slips away. Which brings me to a final point. Just when you think this is a mess that cannot get any worse, enter Tony Blair, with some priggish words of advice about how bad it would be for us to exit Europe. Where were you, Tony, when this issue was decided at the referendum. And what’s the point of preaching to the British government about Brexit, when all they are trying to do is to give effect to the will of the British people. A will expressed in many instances with reluctance, but seen by voters as the only appropriate response to the contempt with which Cameron’s attempt to obtain even minor improvements in the EU was treated by Brussels. Had Cameron done better, had Juncker given more, there would have been no Brexit. And now, of course Juncker, who like the Bourbons, never learns anything, and never forgets anything, is trying the same tactic. Humiliation, rather than negotiation. And the British people won’t put up with that. So get on your bike Tony. We don’t need you to tell us about Brexit. Get over to Brussels and tell them. They are the ones who need to be told that sensible negotiation is the only way forward. And the only chance of us staying in, is if proper, full hearted concessions are made by the EU to meet our legitimate grievances. 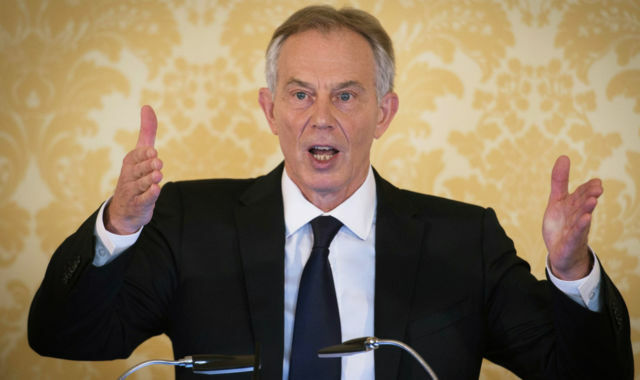 Telling the EU to get real is a mission worthy of Tony Blair’s many and various talents. And it would mean, for the first time in years, he was doing something useful.